After baking, my next favourite “thing” to make in the kitchen is muesli or granola. The flavour combinations are endless and almost everyone in our family has a different preference. Mopp & Miss M fall into raptures over a bowl of Berry Berry Muesli while Mr M happily scoffs the Date & Vanilla Muesli all by himself. The Anster, Mr L and myself have whatever is in the cereal container at the time. 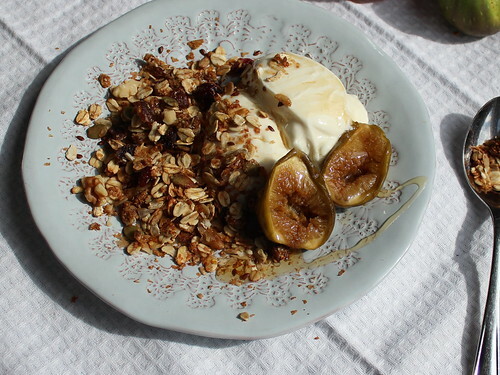 This fig muesli is one of my favourites. Figs are a polarising fruit – some people melt at a mere mention of a fresh fig but others think they’re seedy, gritty and bland. I’m not so fond of them raw but cooked or in jam, I’m in the first category. My mum makes the best fig jam ever – it is sticky, caramel-ly and figgy. I am gifted a couple of jars each year and since no-one else in my house likes fig jam, I scoff the lot in about a week. I planted a fig tree in our garden in the hopes of supplying myself with fig jam but several hundred jars of fig jam later (nice fig jam but not the BEST fig jam) I am yet to replicate mum’s recipe. This muesli recipe helps consume some of the gallons of jam I’ve made. If you don’t have 10 shelves of fig jam like I do, South African Fig Jam is a good substitute but you can use any fig jam. 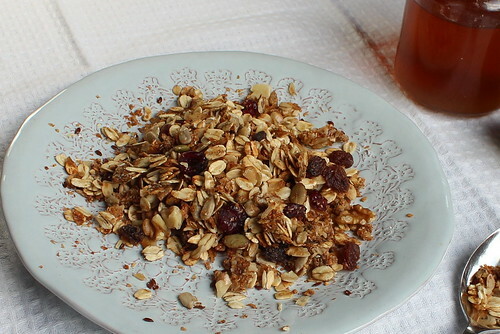 This muesli is crunchy and toasty and smells delicious. This recipe is easily doubled if you have a large roasting dish. If you are not a Weetbix eating family, substitute with bran flakes (similar to corn flakes but made with bran, not wheat bran) or extruded bran sticks. I save the crumbs from the empty Weetbix packets for this recipe, but if you haven’t any, crushing up some whole Weetbix biscuits is perfectly acceptable. In fig season, I serve this muesli with honey-roasted figs for an extra-figgy breakfast. But it is just as good with peaches, tamarillos, bananas, kiwifruit…..whatever you have in the fruit bowl. Place the jam, brown sugar and oil in a small pot and heat until the sugar is dissolved and the mixture comes to the boil. Remove from the heat. Combine the remaining ingredients (except the dried fruit and nuts) in a large baking or roasting pan. Pour over the hot jam mixture and stir thoroughly so all the ingredients are coated. Bake @ 150ºC for 30 minutes, stirring well every 10 minutes. Allow the muesli to cool, stirring from time to time to break up the clusters. Add the dried fruit and walnuts once the muesli is completely cold. Serve with natural unsweetened yoghurt, honey-roasted figs and an extra drizzle of honey. This entry was posted in Breakfast and tagged granola, muesli, Savour by Jo Dohrman. Bookmark the permalink.